Love and death: two absolutes represented beautifully through poetry and dance in Contes Cruels. 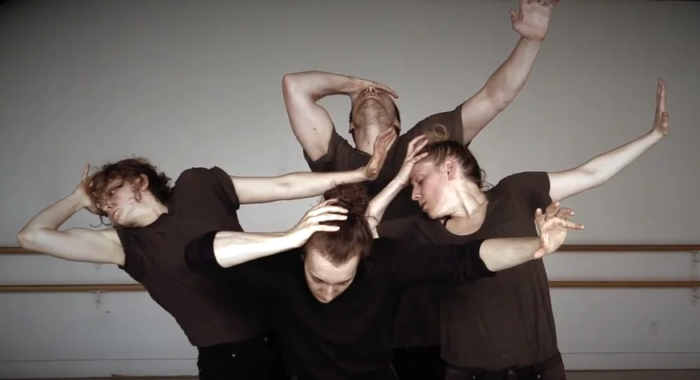 Choreographer Serge Bennathan shares the stage with Josh Martin, Hilary Maxwell, Molly McDermott, and Katie Lowen in this deeply introspective exploration of the sweeping themes of love and death. The piece begins with Bennathan greeting the audience and reciting a Dylan Thomas poem. The other dancers join him and they stand in a line across the stage, slowing moving their gaze from right to left. The movement of their eyes is so slow it’s almost imperceptible. It’s a powerful moment that sets the tone for the rest of the piece. The group of four dancers is synchronized at first, lunging and spinning in fluid arcs around the space. Meanwhile Bennathan recites poetry that talks of “faint possibilities of love” and says that “death is a silent scream.” The dancers break out into two simultaneous duets, each pair propelled by each other’s force. James Proudfoot’s low lighting, at times flickering and often illuminating only one part of the space, added considerably to the emotional texture of the work. Likewise, Bertrand Chenier’s musical composition set the mood as the dancers interpreted the words being read by Bennathan. Although Bennathan was onstage throughout the piece, he only joined the dancers briefly and for the most part acted as a vocal backdrop and director. He explained during the talkback that the piece was influenced by a few life experiences including having cancer a few years ago and facing the idea of death as well as losing his twin brother when he was five years old. Although Bennathan said he doesn’t have a desire to perform again as a dancer, he is interested in using his voice in his work and he also takes pleasure in being in the same space with the dancers. The main goal for this piece, he said, was to have a very bare stage and only the artists and their energy filling it. He succeeded as the stage was brimming with emotional energy that definitely spilled over into the audience.